"I am completely invested in the success of this school and it means a lot to me that I get to give back to the community that shaped me." The Early Childhood Program of Holy Family School promotes the spiritual, emotional, intellectual, physical, and social growth of our students. The program is based on developmentally appropriate activities using a "hands-on" approach. Our curriculum follows the standards set by the Archdiocese of Philadelphia. The curriculum also reflects an awareness of National and State Standards to lay a solid foundation for our students to grow. Our early childhood students enjoy a full curriculum. Preschool (age 3) students explore monthly themes focused on one color, numbers (1-10), one shape. Religion, Science, Social Studies, Math, Pre-Reading and Pre-Writing Skills are integrated into the themes and centers throughout the year. Our PreK (age 4) students explore the following subject areas weekly: Religion, Math, Integrated Language Arts, Social Studies, Science, Music, Art, Physical Education, Library and Computers. This provides a strong academic foundation, and eases the transition into kindergarten and beyond. 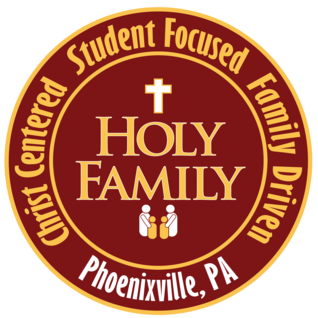 Holy Family caters to your family&apos;s needs by offering a variety of programs, including all-day and half-day options 2, 3 or 5 days a week, and convenient before- and after-school care. Additionally, because we are part of a preschool-8th grade school, families are able to drop all of the kids off at one location: No more running to several schools to pick everyone up! Holy Family is a close-knit school community. Throughout the year, students are involved in events and activities with all grade levels. The Preschool and PreK classes have several activities with the kindergartners throughout the year, including gatherings, a Christmas pageant and End of Year show. Our Early Childhood students are also partnered with older students as Prayer Partners to read stories, do crafts and work on small service projects. This allows our students to get to know the school community, making the transition into kindergarten a breeze! Our Preschool and PreK students are provided with a strong foundation in the Catholic faith through daily prayers and songs. Our teachers create a learning environment that encourages the children to know God and enables them to reach their full potential - academically, physically and spiritually. Note: All children registered for the Early Childhood Program must be toilet-trained prior to the start of the school year. Bus transportation provided to students in Kindergarten through grade 8 only.